Astronaut Mark Kelly, husband of wounded Congresswoman Gabrielle Giffords (D-Ariz.), resumed training today (Feb. 7) for his planned space shuttle mission in April. Giffords has been recovering from a bullet wound to the head since Jan. 8, when she was shot at a constituent meeting in Tucson, Ariz. Kelly originally planned to drop out of the shuttle flight to stay by his wife's side, but because she is recovering so quickly, he announced Friday (Feb. 4) that he is rejoining the shuttle Endeavour's STS-134 mission as its commander. "I started to think about STS-134, about the mission, my crew, the fact that I've been training for it for nearly a year-and-a-half, thinking about what Gabby would want me to do," Kelly said during a Friday press conference. "I ultimately made the decision that I would like to return and command STS-134." Kelly trained with the crew last week on a trial basis, to prove to himself and NASA that he would be able to focus on his work during the mission. Today he resumed a regular, full training schedule at NASA's Johnson Space Center in Houston. Kelly and his five crewmates are slated to launch aboard Endeavour April 19 on a two-week mission to the International Space Station. It is the final flight for Endeavour as NASA prepares to retire its three-shuttle fleet this year. Endeavour's STS-134 crew will deliver new supplies and a $1.5 billion astrophysics experiment – called the Alpha Magnetic Spectrometer – aimed at detecting signs of antimatter and other exotic particles that could reveal clues about the nature of the universe. Today the astronauts will undergo a mission simulation in the Motion-based Shuttle Simulator machine, which reproduces sensations felt during launch, ascent, entry and landing. The few months ahead leading up to the mission are usually busy with practice runs like this, and Kelly will likely have to work long hours. "From now forward, the training schedule for me is what it would have been anyway, it's not going to be any different," he said. Yet Giffords' days are also packed full of rehabilitation exercises with doctors at her Houston hospital, the astronaut said. While Kelly took a break from training to be with his wife, NASA appointed a backup commander, veteran shuttle flyer Rick Sturckow, to train with Endeavour's crew. Sturckow has now resumed his normal duties as deputy chief of Johnson Space Center's astronaut office. 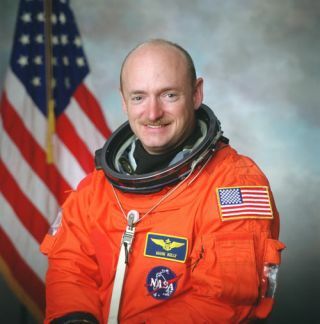 Kelly's twin brother, Scott Kelly, is also an astronaut. Right now he is living on the International Space Station as commander of the Expedition 26 mission. Scott Kelly is due to land back on Earth March 19 on a Russian Soyuz capsule. Endeavour's STS-134 mission is one of NASA's three final space shuttle flights. Before Endeavour flies, NASA plans to launch the shuttle Discovery toward the International Space Station to deliver a humanoid robot and a spare room to serve as a storage closet. Discovery is slated to launch on Feb. 24. NASA's last mission, which has still not received its final funding from Congress, is slated to launch June 28. That mission, to fly on the shuttle Atlantis, will deliver large spare parts and supplies to the space station. NASA has been launching space shuttles into Earth orbit since April 12, 1981. Endeavour's flight will be the 134th shuttle mission since the fleet entered spaceflight service.